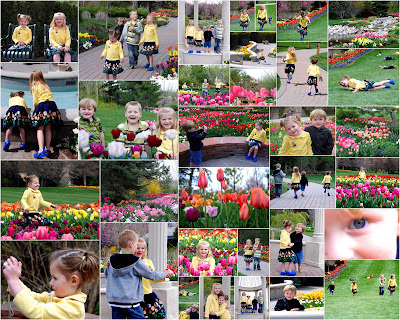 Here's a collage of a bunch of the pictures from the Tulip Festival at Thanksgiving point. I've also included a slide show of the pictures. The girls had a great time with the boys. Ivy wanted to be in the stroller for the first half, so there are more pictures of the bigs with Harrison than there are of Ivy. But, once she got out, she was constant smiles. I love getting to take a day off here and there to play with the girls. (The girls includes Mom and Kat). After the tulips, we enjoyed an ice cream sundae from the soda fountain at Thanksgiving Point, while the kids had ice cream cones. 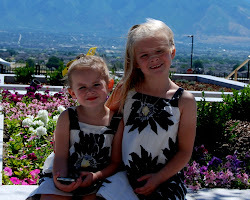 If you live in Utah and haven't been to the Tulip Festival, you really should plan on attending next spring. It's beautiful and they do a really nice job one it. During the weekends and evenings there are booths with treats and crafts. Seriously, when are you going to take my family pictures? You have serious skills, cousin!! Take note on Thursday, you'll have a lot to teach me. And, dang cute outfits, on dang cute girls. Great photos of an adorable crew. You did a great job of capturing the spirit of the day!